The wind whistled and rattled the bare tree branches throughout the Palouse that cloud-covered morning, as it often does in early March, when Old Man Winter and Lady Spring engage in regular tugs-of-war to determine the reigning season of the moment. Brown, crinkled maple leaves, remnants of a milder than usual winter, zigged and zagged across the cracked sidewalk and large raindrops began to splash against her black hair as she dashed to microbiology lab. She was running late—a rarity—creating a sinking feeling in the pit of her stomach about what that portended. Arriving at the lab fueled her anxiety. Rushing to catch up with her classmates, who already had begun the assignment, she was chided by her instructor for mislabeling some of her streak plates. After staying past the scheduled end of the lab to finish her work, she darted through Mother Nature’s escapades a second time to reach her next class and arrived, not surprisingly, late again. Then, after class, another sprint across campus to where she had parked her car, which she had driven to campus this day only because she was running behind schedule. Sure enough, a parking ticket was firmly affixed to the windshield, seemingly immune to the wind gusts swirling around her. But by this time, Rachel Ellenwood’s perspective about the still-young day had reversed course 180 degrees. For the blustery winds had delivered a potentially life-changing message late in the morning in the form of a phone call she could hardly hear outdoors: Ellenwood had been selected as one of just 50 students nationwide—and the first WSU student ever—to win a prestigious Udall Foundation distinguished scholarship. The town of Lapwai is nestled in a valley between rolling hills next to the Clearwater River, about 15 miles east of Lewiston, Idaho, and a 50-minute drive from WSU’s campus in Pullman. The valley has served as part of the ancestral home of the Nez Perce, or Nimiipuu, for millennia. Ellenwood was born and has lived most of her 32 years in this community of 1,100. It’s where her world view is rooted, deep in the Nez Perce culture, deep in values such as compassion for the needy, unwavering support for children and family, and honor and respect for elders. And it’s here where her indomitable drive to persevere—sometimes in the face of tall odds—was birthed, tested, and honed, eventually to become one of her defining personal characteristics. “Everybody knows everybody,” she says of Lapwai. Growing up, “you could go to bed with your house unlocked, your car unlocked. It’s a very trusting place.” And a place where community means looking after neighbors and helping out when needs crop up, whether it’s contributing money so a mother can purchase basketball shoes for a child, delivering a case of water to a family dealing with the death of a parent, or cleaning the home of the deceased. Ellenwood’s mother, Susie, has modeled those traditions for Rachel and her three siblings for decades, planning baby showers for new mothers, leading fundraisers for people ill with cancer, and organizing community blood drives. Susie is a licensed practical nurse at Nimiipuu Health, the town’s medical clinic; she plunged into her LPN studies when her four children were still in grade school. Given those traditions and her mom’s career, it’s easy to understand Ellenwood’s academic focus: she’s enrolled in the pre-nursing program at WSU, pursuing a degree in nursing to fulfill her own dream of improving her community’s health and wellness. Ellenwood is a self-admitted daddy’s girl. She and her dad Kub bonded through sports as she grew up. A retired carpenter and now fulltime grandpa, Kub is a former athlete who starred in Rez ball, the avidly followed Native American version of basketball that features aggressive play, quick shooting, and turnover-focused defense. Kub’s oldest daughter says she inherited her dad’s high energy, work ethic, and positive outlook on life and mimicked and applied those traits as she competed in volleyball, basketball, softball, and track, and participated in cheerleading, yearbook, Native Club, and Pep Club while attending Lapwai High School. Father and daughter share a passion for Cougar sports. Ample evidence of that fervor is reflected in Kub’s man cave, a small wooden structure built on family property in Lapwai that overflows with Cougar gear, including flags, posters, and the jerseys of former football players such as Troy Bienemann, Billy Newman, Sammy Moore, and Lapwai’s own Bryan Boyer. A large, hand carved wooden Cougar greets guests as they drive on to the property. The location is a popular gathering place for sports-themed barbecues for family and friends, especially when the Cougars play. Kub’s zeal for the Crimson and Gray is the stuff of local legend. Even WSU athletes have appeared at the barbecues from time to time. Kub is also a well-known and loved visitor to the WSU athletic department’s offices in Pullman. Kub also assigned the nickname Chedda to Ellenwood when she was about 10, a name that stuck among friends and family. The name has no special meaning; it’s simply a term of endearment. The gesture had a practical benefit too: Ellenwood’s teachers in Lapwai began calling her Chedda to distinguish her from two other Rachel Ellenwoods in the school system. The nursing profession piqued Ellenwood’s interest as a child. She remembers tagging along with her mother to community blood drives initially. In high school, she began assisting her mom at the events and donating blood regularly. Ellenwood’s aha moment happened in high school, while she was enrolled in an early childhood development class. As she learned about a baby’s growth and development—at the same time her mom was teaching prenatal classes—something clicked in her mind. “That’s when I knew this was what I wanted to do, that this was the way I wanted to help other people,“ she says. The road to reaching that goal hasn’t been rut-free. Ellenwood readily admits she didn’t put enough emphasis on academics in high school. As a result, she wasn’t prepared for the rigors of college. 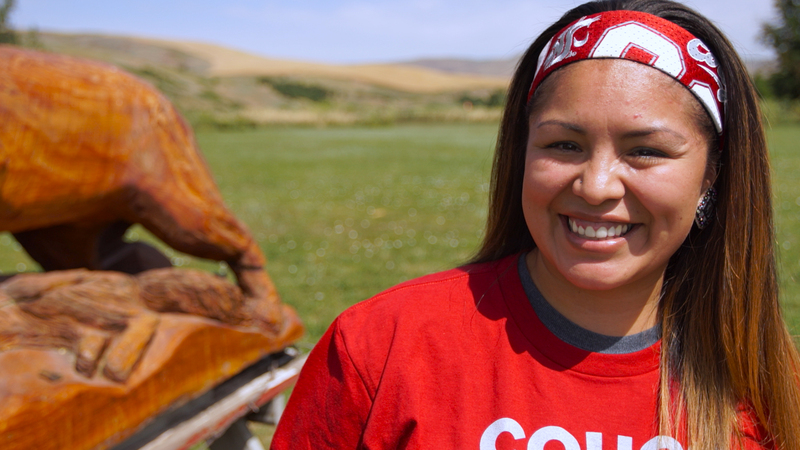 She attended three colleges before arriving at WSU: Lewis-Clark State in Lewiston, North Idaho College in Coeur d’Alene, and Bellingham-based Northwest Indian College (NWIC), which offers videoconference courses in Lapwai and at several tribal locations in Washington. And Ellenwood’s educational journey grew more complicated when her son Terrell was born in 2005, four years after she graduated from high school. She took time off from college to work and focus on her son while he was an infant before eventually deciding to finish the coursework required for an associate degree at NWIC. It was a period that tested Ellenwood’s resolve. After enrolling at WSU, Ellenwood discovered an entire support team prepared to pitch in to further her pursuit of a bachelor’s degree. Those individuals helped her successfully navigate her way through her first year on the Pullman campus and opened her eyes to new possibilities, like the Udall award. Ellenwood heaps praise on the university’s Native American Student Center (NASC), describing its offices in the basement of Cleveland Hall as a sanctuary from the often- hectic demands of academics, motherhood, and everything else life serves up. She’s especially grateful to Autumn Jones and Faith Price, NASC staff members who have helped her find her way at WSU. Price, in fact, was the first person to bring the Udall opportunity to Ellenwood’s attention, handing her a flier about the award last fall and suggesting she pursue it. Ellenwood remembers brushing aside the idea initially. “Then one day I really looked at it and decided I’m going to apply for this,” she says. The application process tested Ellenwood’s tenacity again. She began working on the application in early October to meet WSU’s internal deadline of December 1, after which a review committee would determine which students’ applications would be submitted to the Udall Foundation. Ellenwood’s materials didn’t pass muster with the internal screening committee. She’s quick to blame herself, explaining she didn’t give the application the proper attention. But instead of discouraging her, the rejection email from Sarah Ann Hones, director of WSU’s Distinguished Scholarships Program, only strengthened Ellenwood’s resolve. So Ellenwood met with Hones and explained her wending educational path, her challenges of balancing academics, motherhood, and work, and detailed all of her extracurricular activities. Hones saw something that didn’t come across in the written application. Call it relentlessness, grit, or determination, but Ellenwood demonstrated the X factor Hones was looking for. Fast-forward five months to March, and Ellenwood suddenly found herself serving as a role model for other WSU Native students to emulate. Winning the Udall scholarship is opening doors to new opportunities Ellenwood is just beginning to fully appreciate. The $5,000 scholarship that accompanies the award is an obvious difference maker—for starters, it means she can reduce the number of hours she works as a bartender at the Clearwater Casino in Lewiston to make ends meet. She loves the job, but needs more time to study. And, perhaps most importantly, the scholarship means that, in between attending classes and completing the labs required for her degree, Ellenwood will have a little more time each week to spend with now 10-year-old Terrell, a fifth grader at Pullman’s Sunnyside Elementary School. 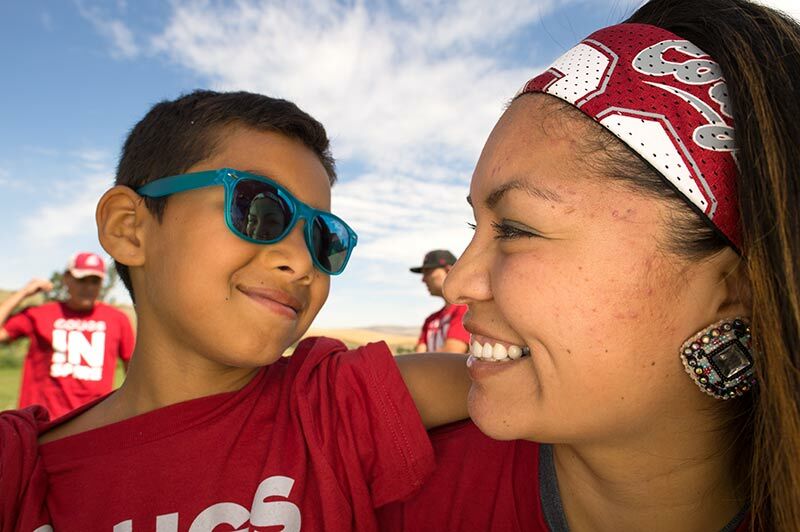 But it’s through her new responsibility as a role model—for other Native American students attending WSU and for all students balancing family and work responsibilities—that Ellenwood realizes she can give back to others and make a greater impact. In August, as part of the Udall award, Ellenwood traveled to Tucson, Arizona, for a four-day conference that brought together all of the 2015 award winners from across the country. The students teamed on a case study, learned new ways to collaborate, and built relationships with each other, Udall award alumni, and professionals working on environmental and tribal issues, two of the Udall Foundation’s areas of focus. “That experience really opened my eyes about tribal issues on a larger scale,” Ellenwood says. “And it helped me realize I have a responsibility to serve as a change agent, to educate others about issues that need to be a higher priority on our national agenda.” The conference also expanded Ellenwood’s professional aspirations as she learned about Native resources available linked to disciplines such as law and the environment. The Udall Foundation was established by Congress in 1992 as an independent executive branch agency to honor longtime former Arizona congressman Morris K. Udall’s lasting impact on the nation’s environment, public lands, and natural resources, and his support of the rights and self-governance of American Indians and Alaska Natives. In 2009, Congress enacted legislation to honor Udall’s brother Stewart, a three-term Arizona congressman and former U.S. Secretary of the Interior, and added his name to the Udall Foundation. Terrell is a gung-ho Cougar sports fan like his mom and grandfather and the rest of the Ellenwood family. Like many 10-year-olds, he wants to attend WSU and play basketball and football when he’s older. Ask him who his favorite basketball player is, and there’s no hesitation: former Cougar and current Golden State Warrior star Klay Thompson, a favorite of all the Ellenwoods because of his personal characteristics as well as his hardwood play. Ellenwood is sensitive about the label “single mother,” but not for the obvious reasons. She says the label doesn’t adequately recognize all of the individuals who support her day in and day out, making her educational quest, motherhood, and life’s other demands achievable. The word Lapwai means place of the butterflies, a name chosen due to the historical abundance of butterflies in the Lapwai Valley. A butterfly might well symbolize Ellenwood’s life, grounded in her community’s values and traditions, her own metamorphosis fully underway as she soars toward a bright future.